Want to advertise yourself as the best candidate for the job? Model your resume after our sample for an ad account executive. To be a successful candidate for advertising jobs, resume expert Kim Isaacs says it helps to have a comprehensive resume. Are you skilled at pitching creative concepts to clients, but need help pitching yourself on your resume? 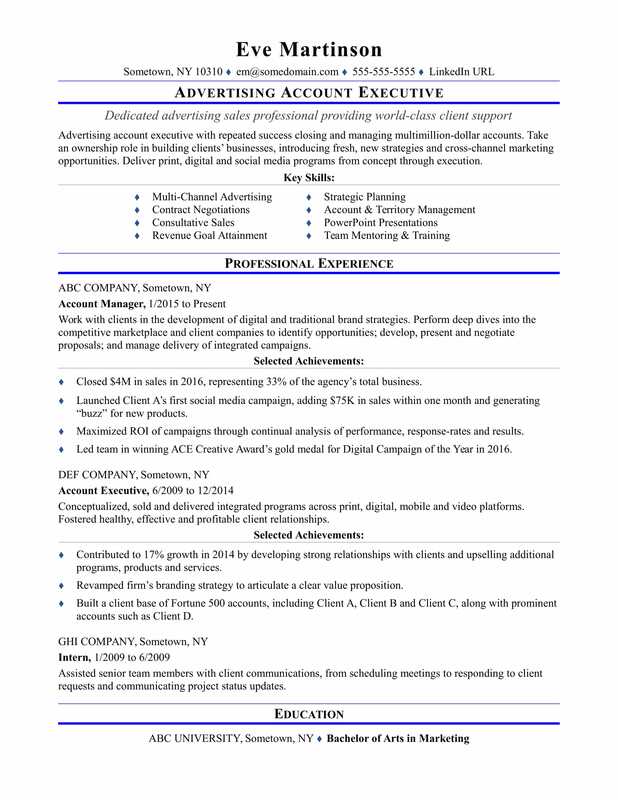 Get ideas on how to craft a better resume from this sample for an experienced advertising account executive that Isaacs created below. You can also download the sample resume for an advertising account executive in Word. And if you need more help, let the experts at Monster's Resume Writing Service create a high-impact resume for you that will impress employers. Jobs for advertising executives are projected to grow by 10% (or 23,800 jobs) from 2016 through 2026, which is faster than average, according to the Bureau of Labor Statistics (BLS). You'll find the highest level of employment for this job in the following states: New York, Illinois, California, Massachusetts, and Texas; and in the following metropolitan areas: New York City, Chicago, Boston, Los Angeles, and San Francisco. As an advertising executive, you can expect to earn a median wage of $129,380 per year, or $62.20 per hour, according to the BLS. Additionally, you can learn more about advertising careers and search for advertising account executive jobs on Monster. Advertising account executive with repeated success closing and managing multimillion-dollar accounts. Take an ownership role in building clients’ businesses, introducing fresh, new strategies and cross-channel marketing opportunities. Deliver print, digital and social media programs from concept through execution. Work with clients in the development of digital and traditional brand strategies. Perform deep dives into the competitive marketplace and client companies to identify opportunities; develop, present and negotiate proposals; and manage delivery of integrated campaigns. Closed $4M in sales in 2016, representing 33% of the agency’s total business. Launched Client A’s first social media campaign, adding $75K in sales within one month and generating “buzz” for new products. Maximized ROI of campaigns through continual analysis of performance, response-rates and results. Led team in winning ACE Creative Award’s gold medal for Digital Campaign of the Year in 2016. Conceptualized, sold and delivered integrated programs across print, digital, mobile and video platforms. Fostered healthy, effective and profitable client relationships. Contributed to 17% growth in 2014 by developing strong relationships with clients and upselling additional programs, products and services. Revamped firm’s branding strategy to articulate a clear value proposition. Built a client base of Fortune 500 accounts, including Client A, Client B and Client C, along with prominent accounts such as Client D.
Assisted senior team members with client communications, from scheduling meetings to responding to client requests and communicating project status updates.